Carpets cleaned: Before moving in, it is a great idea to get your carpets professionally cleaned. Doing this ensures that where your new home is completely sanitized, and it is also much cheaper to do it before your belongings are in the home. Plan your emergency exits: Looking at your homes layout and considering the best escape routes is a great way to ensure you do not put any furniture items in the way. Thinking ahead could save a lot of time in an emergency! Look over your home inspection report: Reviewing this document will alert you of any problem areas in the home, and let you know of anything to fix before moving in. Once you are done, make sure to file them in a safe place. Deal with water issues NOW: While looking over the inspection, there may be things that can wait to be done. Water is not one of these items. Mold can set up in as little as 72 hours, so being proactive is the best way to ensure you do not have a costly insurance claim in the future. Caulk everything: When walking through the home, look for places where the caulking is wearing down. 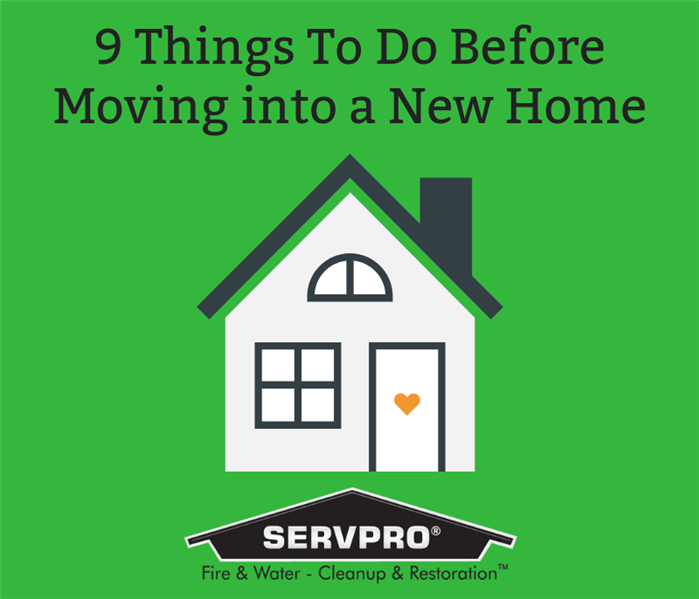 Doing this before you move saves time and is much easier. Locate your circuit breaker box: Don’t want until you need it to know where it is! Change your alarm batteries before moving in: Doing this will give you an exact date to replace them again. Clean out the gutters: While this task may not be fun, it is necessary to do every now and then. Cleaning it out right after you move is a great way to spot previous damage, and ensure that it is done properly. Last but not least, change the locks: While the previous owners probably do not mean any harm, it is a good idea to change them. Over the years, they have probably given a key to a friend or neighbor, and there may be copies out floating around still. SERVPRO of Butler, Hopkins, Ohio, Muhlenberg & Edmonson Counties strives to be a one-stop-shop when it comes to repairing your home. We know when a disaster happens in your home that it is one of the most stressful times in your life. Therefore, we are constantly adding more services to our lineup, with the goal of making it easier on the customer. Being able to call one office to find out about what exactly is going on in your home is a huge relief to clients. We are primarily known as being a water restoration company, but some of our other lesser known services include mold, fire, smoke, vandalism, biohazard, air duct and carpet cleaning. This month, our representatives in the field are giving our insurance agents and other contacts 3-in-1 desk cleaning tools. The goal of this is to remind them that we are a one-stop-shop when it comes to their clients needs! Over the years we have gotten many calls asking about unusual situations, seeing if we can help. One situation in particular involved an employee. After purchasing a used car, she started noticing a slight smoke smell. As time went on, the smell got stronger. One day, she was talking to one of our Production Managers and mentioned it. The next day, the manager had her pull her vehicle into our warehouse, and he set up an ozone machine inside. Within a few hours, the machine had completely removed the lingering smoke, and replaced it with a neutral smell. After a few weeks, the car returned to smelling like a normal car. About a year later, the car has still not returned to that smoky smell. If you ever have a question about something that is not completely normal, give us a call. We can come up with a plan of action to get it done! During the month of March, SERVPRO of Butler, Hopkins, Ohio, Muhlenberg and Edmonson Counties is educating our insurance agents, contacts, and communities on how SERVPRO if committed to saving money on any job, big or small. When we get a phone call about an issue, we assess the severity, and quickly decide the best course of action. We are committed to being onsite as fast as possible, to prevent more damage from happening. Being proactive is the best way to save money and prevent damage from spreading. During a water loss, another one of SERVPRO’s goals is to dry out your home before tearing out. This can save you time and money by not having to replace items in the home. This month, our representatives are giving out LifeSavers to remind our contacts that we are here to SAVE you money! When disasters happen in your vehicle, do you know who to call? -We have worked with police departments and cleaning biohazard out of their cruisers. -There was an incident when a fire extinguisher sprayed the inside of a new truck completely white. -An employee bought a used vehicle, and after the “new car smell” wore off, realized it had been smoked in. With being allergic to the smell, we took care of it for her. We were able to completely mitigate the smell, and months later it still has not resurfaced. How important is it to keep your doors closed at night? Sometimes it is hard to convince parents or children to keep their bedroom doors closed at night. This creates fear that you cannot hear one another, and as a parent you want to be able to hear if something is going wrong with your child. On the flipside, most children want to be able to get to their parents as quickly as possible if they need anything. But when you look at these two photos, it creates awareness about another fear: house fires. When a house fire happens, the flames spread quickly. When we are sleeping, we are less likely to realize what is going on if our fire alarms malfunction. 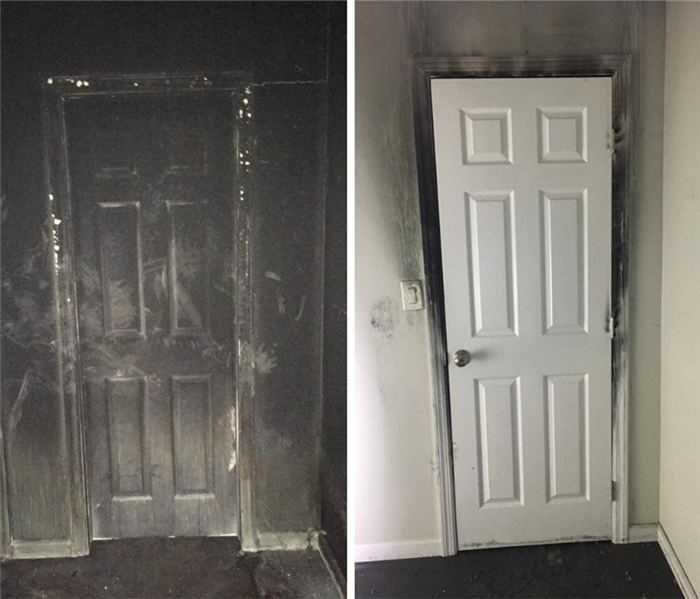 A fire department in New York recently posted photos of a door that was closed during the fire and one that was open. The difference was astonishing. The fire was almost completely stopped by the closed door, vs. the door that was open was completely burned. This month, SERVPRO of Butler, Hopkins, Ohio, Muhlenberg and Edmonson Counties wants to stress how important it is to be proactive and winterize your properties. With February being one of the coldest months of the year, we see a lot of frozen pipes happen. Being proactive is the best way to avoid this being your home or business! Our marketing representatives are busy handing our hand warmers to their contacts this month, to remind them to always be proactive when it comes to cold weather. While you might not think about having hand warmers on hand, you would appreciate having one when you needed it. We also want to stress to contacts that during the month of love, we want to make sure to keep things warm between us! Throughout December of 2018, the weather stayed mild. We saw some snow flurries, but that was about it. Until the end of January, we thought we were going to have a pretty mild winter altogether. The last week of January, a Polar Vortex has hit the United States with temperatures going into the negatives, and wind chill being even colder than that. All over the country, schools, universities, and businesses are shutting down to prevent people from having to get out in the cold. 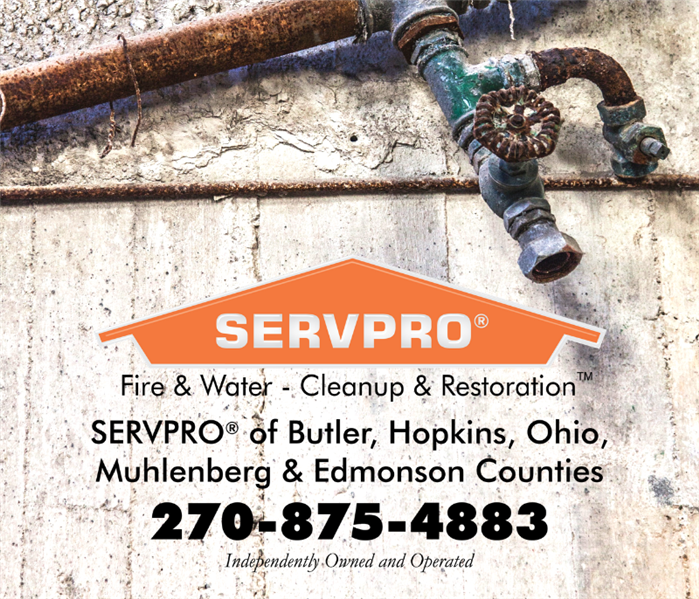 Being a 24/7/365 business, SERVPRO of Butler, Hopkins, Ohio, Muhlenberg and Edmonson Counties has not shut down. With the risk of many home and business owners’ pipes freezing and busting, we are ready to assist at a moments notice. Busted and frozen pipes are no joke, and at SERVPRO we take them very seriously. As soon as you notice any water leaking from your pipes, give us a call for a free estimate. The quicker we are onsite, the more time we have to prevent further damage to your home or business. 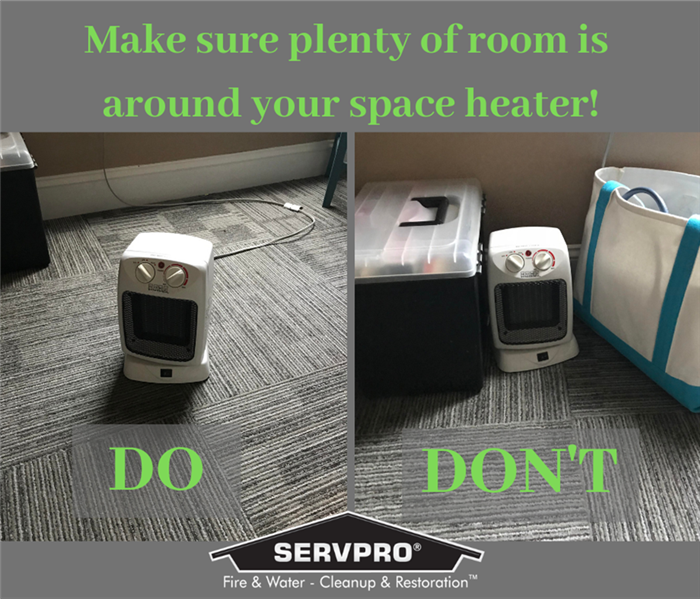 This time of year, many people use space heaters to heat their home or office. While these compact heaters are handy to have, they are also the cause of many fires around the county. This can easily be avoided though by being proactive and using caution. One of the main ways they produce fires is if they are placed too closely to flammable objects. These include furniture, bedding, mattresses and clothing. It is finally the 1st of the year! With the busy Holiday Season behind us, we look forward to serving the needs of all our communities we are a part of. Each month, we have a different theme, and January’s theme is us being FIRST! We want to be the FIRST person you use his year for any of your mitigation or rebuild needs. Your FIRST call when a client has any type of loss. The FIRST eyes and ears on site of any claim. 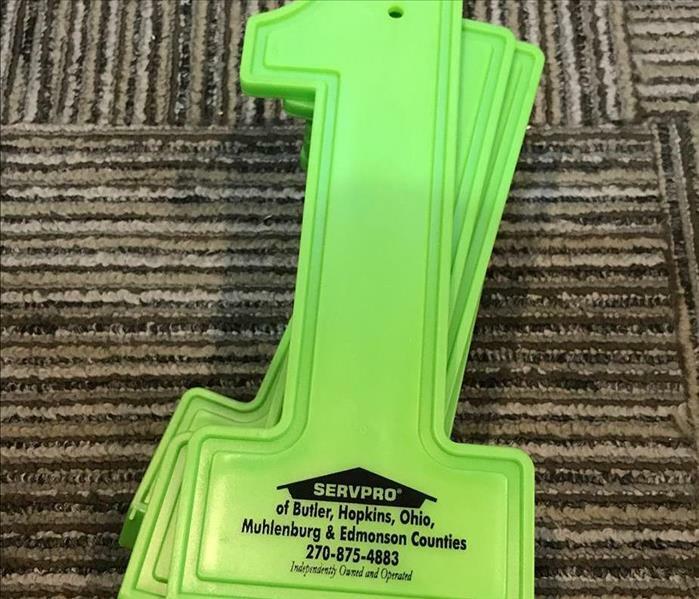 To remind our contacts that we want to be FIRST when dealing with any type of loss or cleaning, we are giving away these bright green SERVPRO ice scrapers this month. Why an ice scraper? This is an item that you might not always have a need for, but are always grateful to have in that time of need. This is the same concept with SERVPRO, everyone is thankful for us in their time of need. 2/15/2019 - How important is it to keep your doors closed at night?